Deep down any football fan of a lower level team (and by lower level I mean anyone apart from Man City, Man Utd or Chelsea) wants to see their team play in a cup final – yes Arsenal and Liverpool fans I am also talking about you. We all say “who really wants to win the Carling Cup/Johnstone Paint Trophy/FA Trophy” when we are knocked out of the competition to a lower level team, but if our team ever gets to a final we all know the fans will come out in force. It is amazing to think that clubs were average attendances sometimes barely break 2,000 can muster ten or twenty times that when there is a cup final in the offing. Take the example of last season’s FA Trophy Final. Darlington played local rivals Mansfield Town at Wembley Stadium. The attendance? 24,668 which was less than in previous years. Nearly 15,000 had come down the M1 from Nottinghamshire for their first appearance at Wembley Stadium. 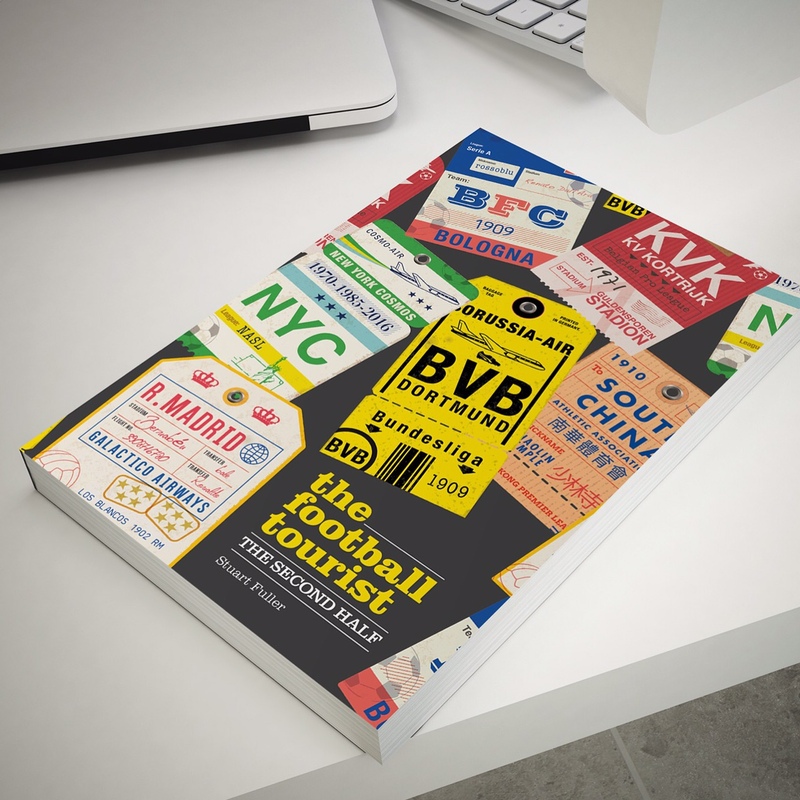 Yet in the fixtures between the two sides earlier in the season the crowds had been 2,234 and 1,614 respectively. 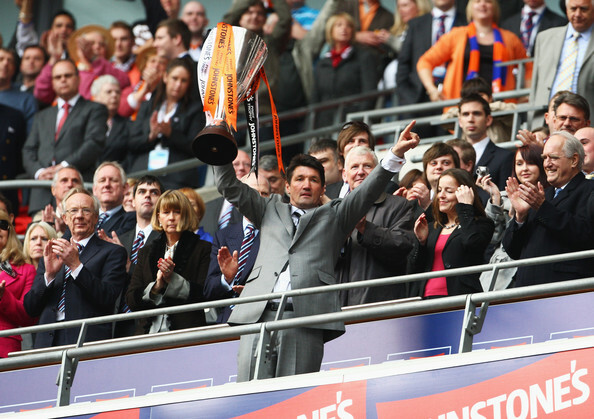 Or who can forget the site of Luton Town legend Mick (friend of The Ball is Round) Harford holding aloft the Johnstone Paints Trophy at Wembley Stadium in April 2009? The Hatters were about to be demoted from the Football League thanks to the ridiculous 30 point penalty levied on them by the authorities yet nearly 40,000 fans had made the short hop down from Bedfordshire for the game. 40,000 is quite a difference to the average 6,019 who attended games at Kenilworth Road during the season. The magic of the cup eh! Lewes are another side starved of cup final glory. Our Wembley aspirations this season were firmly shut by Bonfire night thanks to away defeats to lower league Chertsey Town in the FA Cup and Harlow Town in the FA Trophy. Our last cup final was many-a-year ago in the Sussex Senior Cup (in 2006 to be precise) so like most fans at this level, The Rooks feel they deserve a chance to dust down the Rosettes and the tin-foil replica’s of the trophy. Despite the early exits in the two FA competitions we had made steady progress in the other two cups available to us. In the Sussex Senior Cup victories over Wick and East Grinstead have set up a mouth-watering local derby next week with Eastbourne Borough but first up was the quarter final of the Ryman League cup against AFC Sudbury. The competition, which had been renamed the Alan Boon Trophy in honour of the ex-Staines Town chairman who had done so much for Non League football had proved to be incredibly competitive this season. 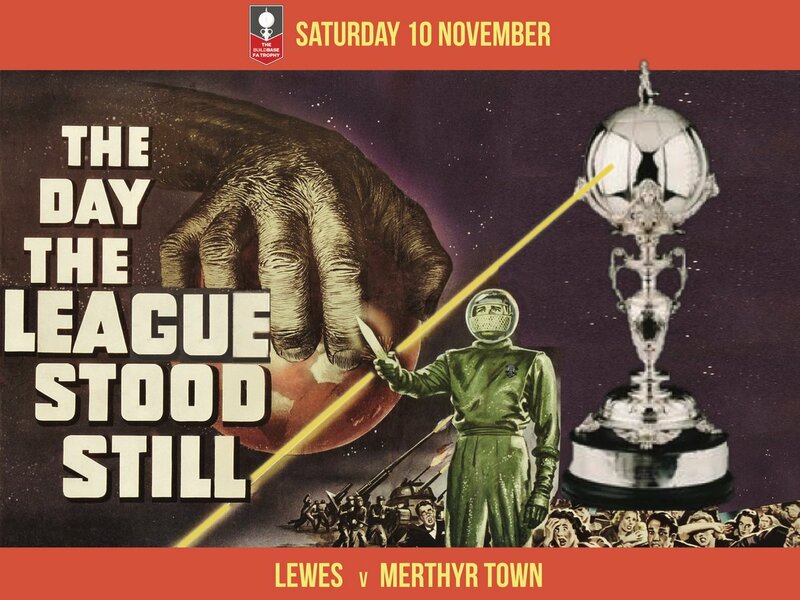 Lewes had overcome Crawley Down and Folkstone Invicta in the early rounds before being drawn away to Met Police in December. A hard fought 2-1 victory put the Rooks in the last eight of the competition and fortunately avoided a long away trip (also in the draw was Lowestoft Town and Bury Town – both 3 hour plus away trips). 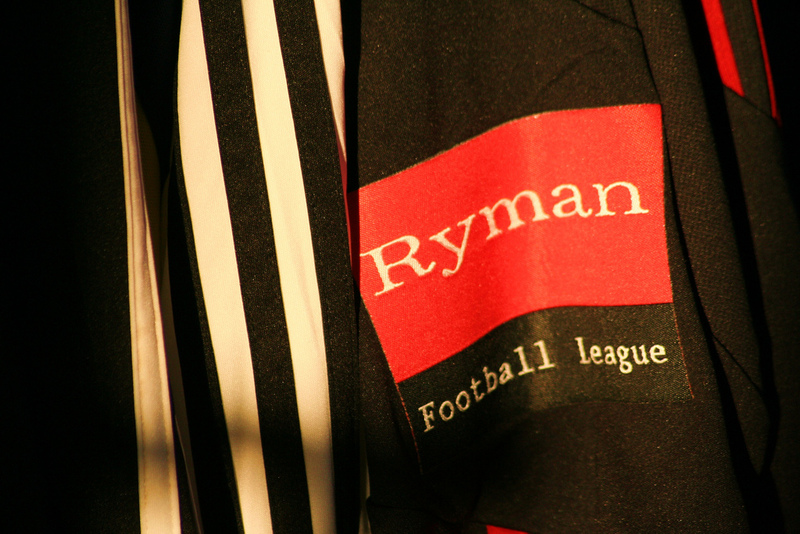 Instead a home tie against Ryman League North AFC Sudbury was our reward. That is not to take anything away from the Suffolk club. We visited them last season, thoroughly enjoying the afternoon in the sunshine at their smart King’s Marsh ground. They have tasted success before as a non-league side, reaching three consecutive FA Vase finals. Alas it was in the period when Wembley was being rebuilt and so they cannot wear the “I’ve played at Wembley” badge. After the impressive turn out on Saturday for the visit of Kingstonian it would be interesting to see how many would be back for this match. Cheap admission (just £5 for the 700+ Lewes Members), warmer weather (a balmy 13 degrees forecast for East Sussex), the lure of a cup semi-final appearance and the second game of Simon Wormull’s temporary stewardship of the team. All valid reasons for people to get on down to the Pan for this one to see if Lewes could join Lowestoft Town and Bury Town in the semi-final draw and be just one step away from the final at Staines Town’s Wheatsheaf Park. This really was a journey and a half on a wet and misty evening for the visitors and it was no surprise that we received notice from them that they were delayed north of the river. 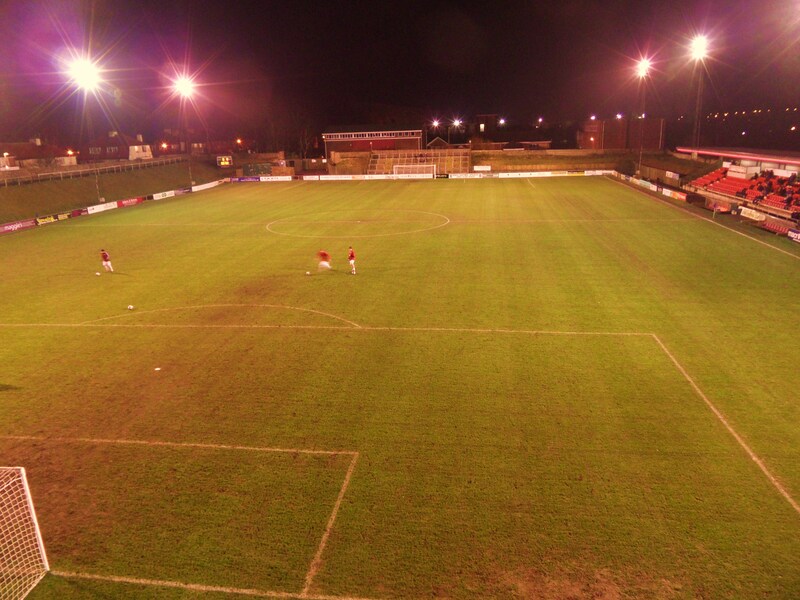 As time ticked on the referee instructed the Sudbury players to be “changed and ready for action” by the time they arrived at the Pan, which they duly did around 7.45pm. A quick warm up on the pitch and it was time for the fate of the two teams to be decided. As a neutral penalty shoot outs are the best invention ever. As a fan who is watching one unfold in front of you it is a completely different affair. Every time a player comes up to take one you feel yourself trying to get into their head, trying to work out what they will do. At 10.08pm last night when, after eleven spot kicks, Lewes keeper Rikki Banks dived low to his left and pushed the ball out we could all breathe a sigh of relief. This extended torture was not in the script. The game had started with both teams playing some decent football. Sudbury surprised the home fans with their expansive play and created the first real chances of the game which Banks had to be alive to. Lewes rarely threatened the Sudbury keeper in the first half an hour, and what balls were pumped into the box were easily handled by their keeper. Michael Malcolm saw his toe poke past the keeper roll agonizingly for the Lewes fans towards the goal but then hitting the post and falling to safety. However, as if to remind the Lewes fans standing on The Jungle that football can be a fickle master, Sudbury then went and took the lead when Robbie Martin’s “lofted” shot flew over Bank’s head. This was not in the script. Fortunately the lead only lasted ten minutes as Matt Somner powered in a near post header from a Nanetti cross to level the scores. I don’t think any neutrals or Sudbury fans could say that the second half wasn’t one way traffic as Lewes pounded the visitors goal. The Rooks had three shouts for penalties which 99% of officials would have given (well, two of them anyway – the third appeared to have been committed inside the area but he gave it outside) and Malcolm, Booth and youngster Howell all went incredibly close. With five minutes to go we had a horrible thought – “Does Simon Wormull know if the game finished all square it goes straight to penalties?”. ClubSec Kev was dispatched to the bench to find out – fortunately he knew which was handy as at just on 10pm the referee blew full time and the game would be decided by spot kicks. I could describe them all in glorious detail, but instead Lewes owner Matt Holland filmed all of the tension on his trusty iPhone where I can be seen in the foreground as calm as anything (in front of Big Deaksy, who is the big chap in front of camera). There always has to be a winner and a loser in penalties, and whilst we commiserate our visitors, our attentions now turn to the draw for the semi-finals and the hope we avoid long away trips to Bury Town and Lowestoft Town. The magic of the cup is still alive and well in East Sussex. Postscript: Just as the game was starting, the club announced that manager Steve King had left after a mutual consent agreement had been reached. 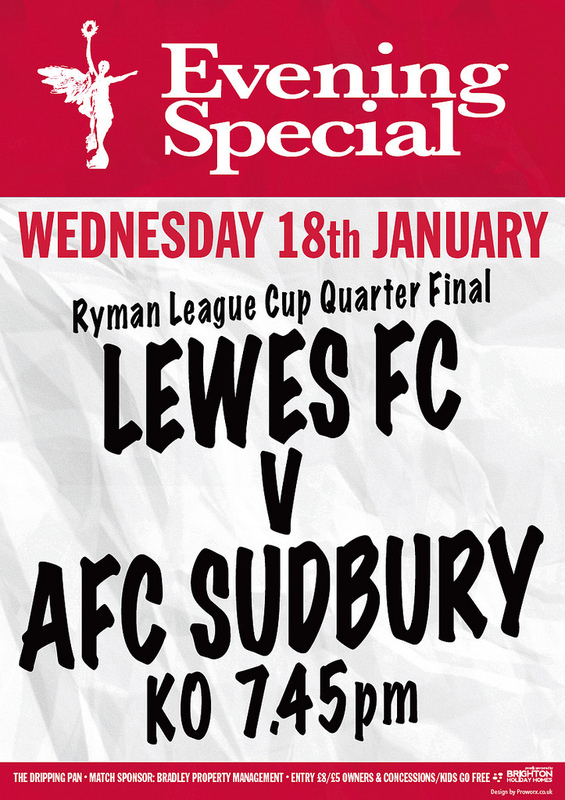 This entry was posted in Lewes FC, Non league football and tagged AFC Sudbury, Dripping Pan, Lewes, Ryman League Cup. Bookmark the permalink. Thanks for the hat-tip sir. Excellent write-up, as ever.